Our Elderberry Ranch is approximately 1560 square feet of custom living! The Elderberry is a three bedroom, two bathroom ranch with basement stairwell, and open concept floorplan. Enter the home into the spacious Living Room, an optional fireplace is available to add here, and great wall space for furniture placement. The Kitchen features a large island with an overhang for extra seating and a waterfall countertop that is beautiful, extra storage space, and countertop prep space. 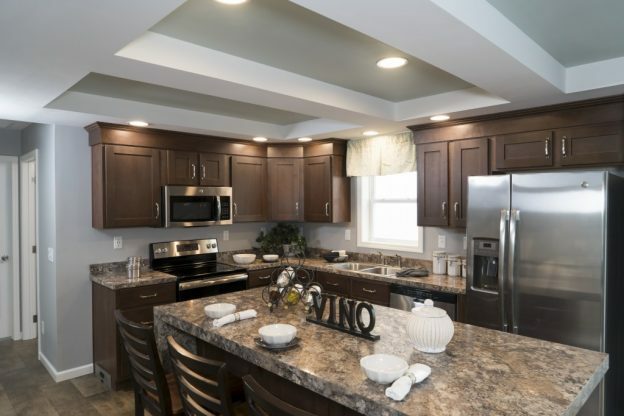 The Kitchen offers a good amount of cabinet and countertop space, our GE Appliances, and nook dining space. The bedrooms in this home are separated by the living space. The secondary bedrooms are off the kitchen hallway as well as the secondary bathroom and utility space. This home lends itself to an end garage application. The Master Bedroom is off of the Living Room and has a large walk in closet and attached bathroom. The bathroom features a tub/shower and single sink as standard but we offer great options for the bathroom to make it your own. A retreat is off the Master Bedroom, it can also be converted to a Hobby Room with entry from the nook! You must see this home, you can view the photos of our show model and the video as well! This entry was posted in New & Info on October 21, 2016 by hshearer@commodorehomes.com.